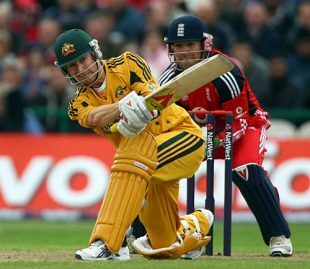 Australian batsman Cameron White has said that Michael Clarke should remain the first choice for the Twenty20 captaincy. White, current vice-captain Clarke and Brad Haddin are the candidates in the running to fill the role, following the retirement of Ricky Ponting from Twenty20. White, who has led Victoria to all four finals of Australia's domestic Twenty20 Big Bash tournament, said he was happy with his own credentials but backed Clarke, who's the favourite to take over. The Victoria coach Greg Shipperd said earlier this month that White would be an ideal fit for the captaincy, keeping in mind that Clarke may quit at least one of the limited-overs formats to concentrate on Tests and prolong his career. Clarke has had his share of injuries and was ruled out of Australia's opening Champions Trophy match against West Indies on Saturday due to a sore back. White has an impressive Twenty20 record as a batsman, with a strike rate of 151.67 in 46 domestic Twenty20s. He has represented Australia in eight internationals, with an average of 41.40. Cricket Australia is expected to announce Ponting's successor at the conclusion of its board meeting next month.